Photo courtesy of Jim Scott. 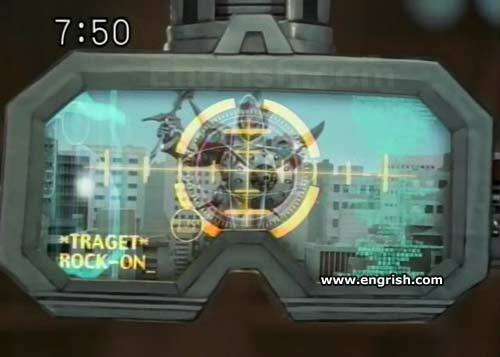 From the Japanese anime “Tokusou Sentai Dekarange”. Rock out with your weapon out! All your bass are belong to us! Drums too! This Engrish is a real tragety. Is this from the video for the Def Leppard version or David Essex’? Darling, those padded shoulders are just so 7:50. That monster’s gonna destroy Tokyo! Oh wait, it’s just that guy from GWAR. All the Traget stores in town, beware! Traget = Tragic ending for Target Canada when it went out of business. 7.5″ isn’t much for a Lobot 15 stories high. If it’s sold at Bunnings, it will probably break within 3 days. iLock and uLock too dude. Load Runner & Wire E. Coyote instead. this is a SOLID proof that this series editor is a STONER for sure. That “Traget” is even in this show’s TV.com page! @Big Fat Cat – Actually a typo. AND ITS NOT AN ANIME!!! What happens next? Does he jump up and down in his blue suede shoes?